An air handling system will be engineered for 100% design flow, but many times could operate with less flow. Let's say that 50% flow is required sometime. What are the options? See Figure 1. Dampers may be noisy and have limited turn down. Inlet vanes restrict flow even when wide open. The VFD has the ability to realize the fan to exact needs through speed control. 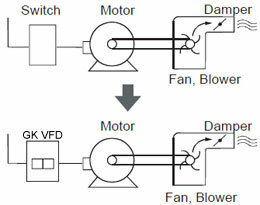 The VFD also reduces fan noise while at the same time saving the most energy. Does this justify the extra cost? 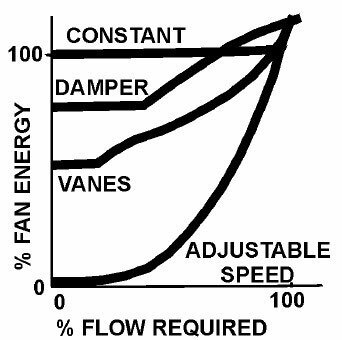 Figure 2 shows fan energy required vs. flow for the various methods of flow control. 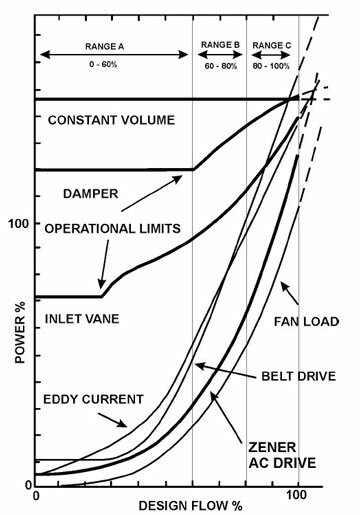 These curves indicate substantial reductions in fan energy through speed control. Cost of electricity (including demand and power factor penalties). Hours/year from 0 – 60% flow – Range A.
Hours/year from 60 – 80% flow – Range B.
Hours/year from 80 – 100 % - flow – Range C.
See Figure 3, which illustrates that savings in each of the flow ranges indicated in D, E and F above are relatively constant in any one range, but are substantially different one range to another. Improved accuracy of payback calculations will result from an estimate of hours/years in each flow range. Reduced mechanical wear and associated maintenance. Reduced power "demand charge" because the motor is started softly with no inrush current. Variable frequency is the best method of flow control and the VFD motor speed control will give you superior performance. Why? Least maintenance (saves wear and tear on the fan too). Highest (near unity) power factor. Local sales, service, and application specialists. All curves are based on the use of an AC motor with 90% efficiency at full speed, full load and typical reductions in efficiency for reduced load. The savings, in % power, between the VFD curve and, for instance, the damper control curve, were measured at 0, 60, 80 and 100% flow. This allowed calculation of an average saving figure in each flow range, which could be multiplied by the number of hours per year in that flow range.